We are authorized dealers of Greg Darnall Bits and Spurs and offer quality bits from this company at discount prices to you. Items that are in stock are available for immediate shipment. Any item that is shipped from the manufacturer will be noted. In stock items being shipped from the manufacturer are usually shipped within five days, or as availability permits. FREE shipping is for the lower 48 states ONLY!!! All Sales are Final. Due to low prices we do not do refunds, returns, or exchanges. INTERNATIONAL BUYERS-- Only in stock items ship International. Please inquire for shipping costs and you are responsible for all Custom Duties for your country. We take Pay Pal, Postal Money Order (No cashiers checks or Personal Checks) or Bank Transfer at this time. 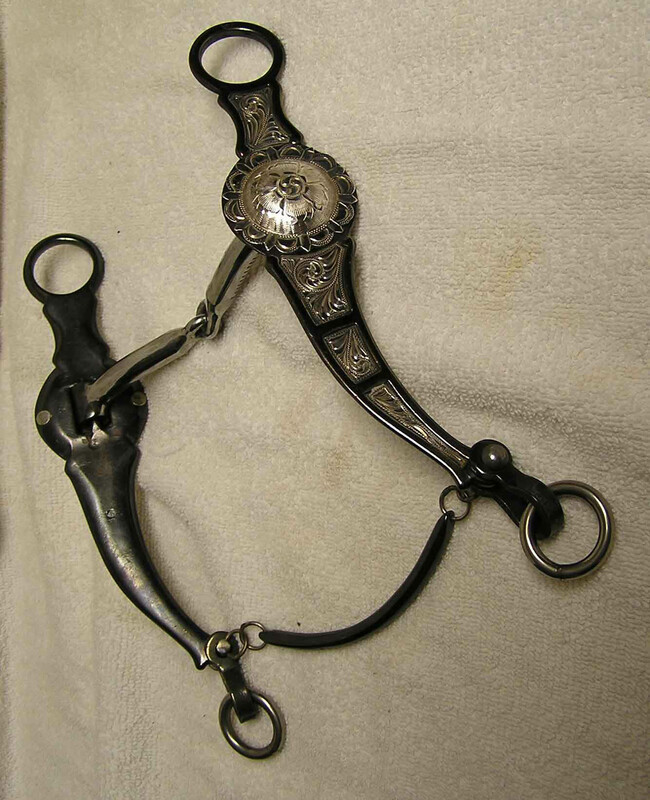 This Don Dodge designed snaffle is for the colt in training - the first bit to go in the colt's mouth. The "butted" rings allow cheek pressure to be spread over a wider area than conventional ring snaffles reducing the incidence of sore, raw corners on the mouth. All mouths are a standard %' width with inlaid copper bars to promote moisture and sensitivity. This is the classic snaffle bit. Made of cold steel, it is designed to rust creating a pleasant "sweet" taste. Features 2 3/4" cold steel butted rings with a 5" mouthpiece made of 7/16" "sweet iron with copper inlay. 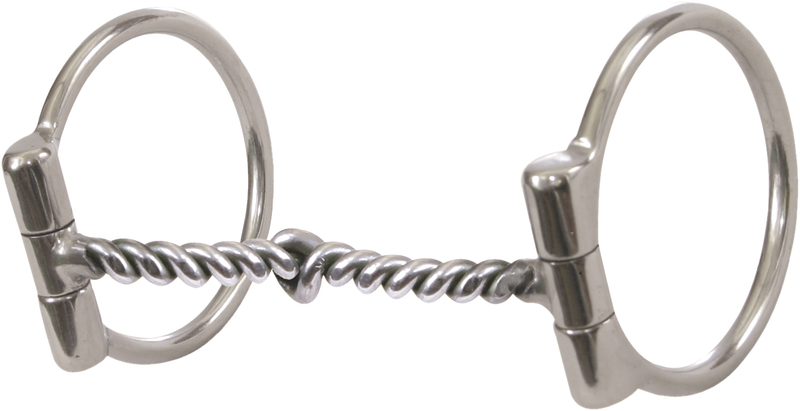 The Square Twist is used for a pushy colt or older horse who is pushier than normal. The square edge goes 360* and signals the colt to back off. Made of cold steel that will rust and develop a sweet taste. Features 2 3/4 " cold steel butted rings with a 5" sweet iron mouthpiece. Our Price 75.00 Sold Out! 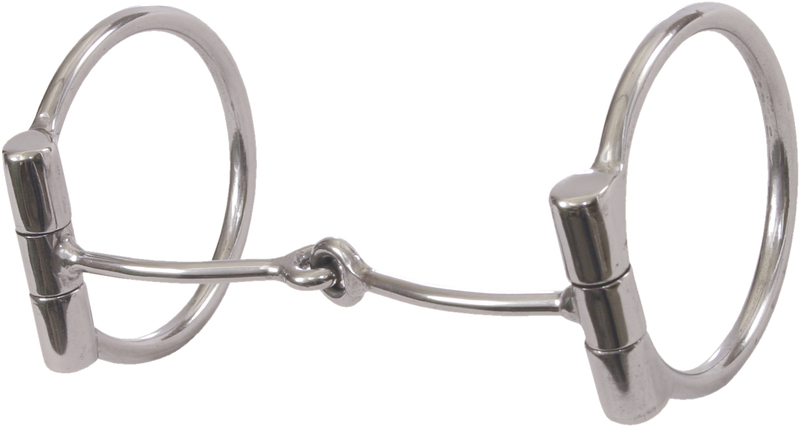 The 3/16” snaffle is a very effective training tool for a horse that is a little tough and needs some softening up. Made of cold steel, it is designed to rust creating a pleasant “sweet” taste. Features: 2 3/4”, cold steel butted rings. 5” x 3/16”, “sweet-iron” mouth. 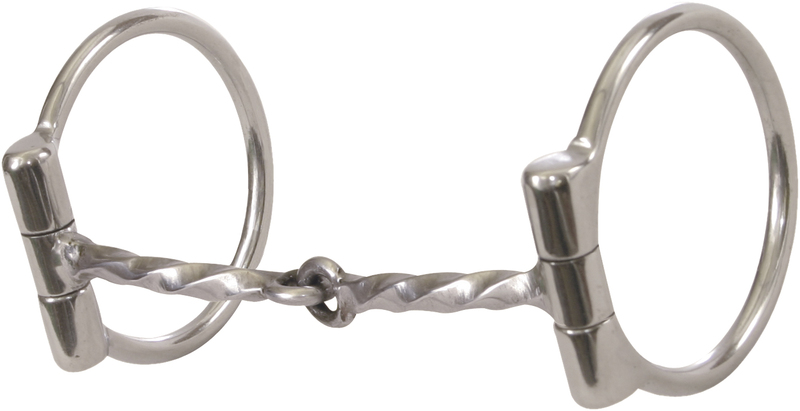 This is the classic snaffle that a colt will carry comfortably when training or showing. The hand engraved Sterling Silver trim adds a professional look to this effective tool. Features: 2 3/4”, black butted rings with hand engraved Sterling Silver trim. 5” x 7/16”, “sweet-iron” snaffle with copper bars. Our Price 185.00 Only 1 left!!! 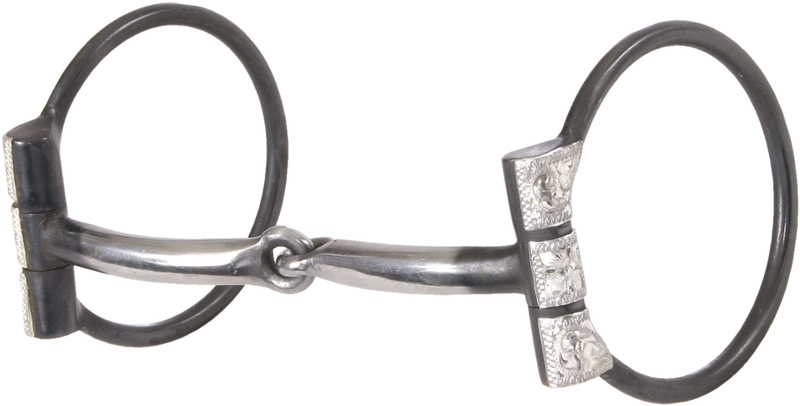 The Iron Twist snaffle was designed with the tough-mouthed horse in mind. When used correctly it will help to soften the tough-jawed colt or old war horse. The cold steel mouth is designed to rust creating a pleasant, sweet taste. Features: 2 3/4”, cold steel or Stainless butted rings. 5” Iron Twist snaffle . 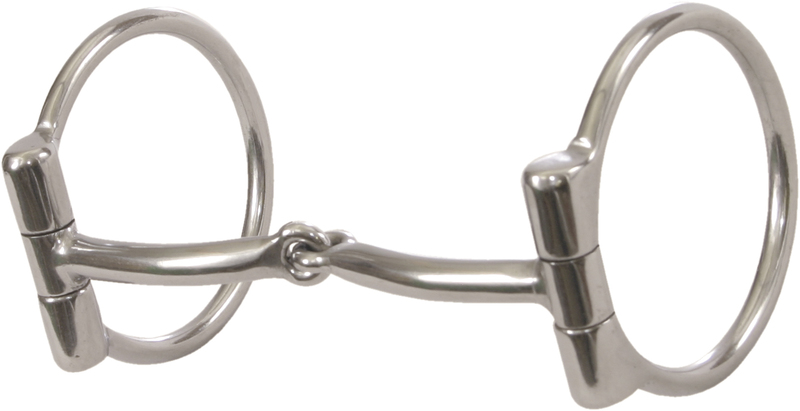 This is the classic snaffle that a colt will carry comfortably when training or showing. Made of cold steel, it is designed to rust creating a pleasant “sweet” taste. Features: 2 3/4”, cold steel butted rings. 5” x 3/8”, “sweet-iron” snaffle with copper bars. 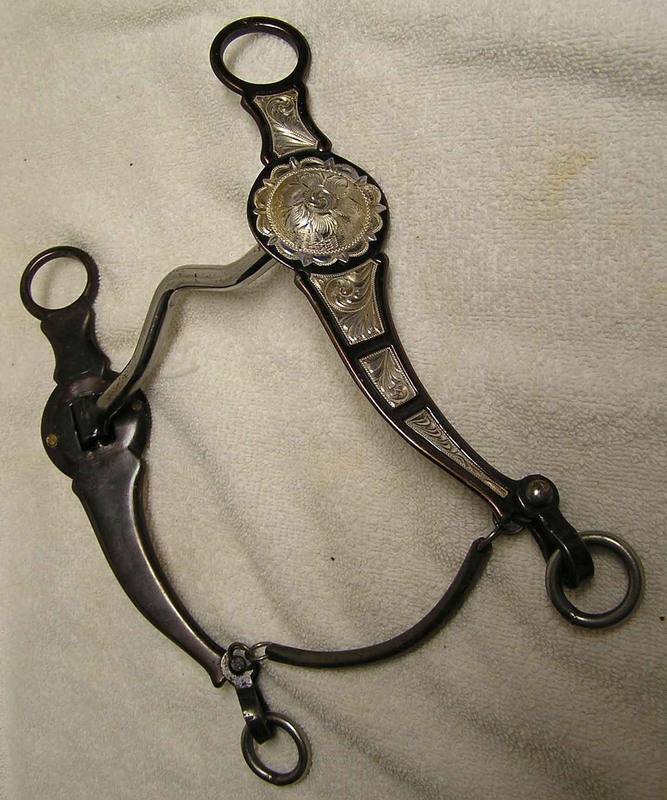 Inspired by the famous U.S. Army shank, the Cavalry Shank was developed fort the more experienced, older horse. The long 8 1/4" shanks are heavier with increased leverage to send a faster signal. This bit can be more severe and should be used by experienced riders. All mouthpieces are a standard 5" wide with inlaid copper bars to stimulate moisture and make training more comfortable for the horse. This superbly balanced bit has tremendous feel and displays art quality, hand engraved Sterling Silver inlays. Also called a "straight- hanger", it was designed for the truly finished horse and reflects the traditions of the great California Reinsmen. All standard mouthpieces are 5" wide with inlaid copper bars. 5” x 5/8” Regular US Port Mouth, Inlaid Copper Bars with a copper Cricket and slobber bar. Hand Engraved Sterling Silver Inlay. Want quality at an affordable price? This bit features 8” Cold Blued Steel California Loose Shanks. 5 x 7/16” Snaffle Mouth, with Inlaid Copper Bars and slobber bar. This bit features 8” Cold Blued Steel Loose California Shanks 5” x 3/8” Low Port Mouth, Inlaid Copper Bars, and slobber Bar. The Loomis bit, inspired by legendary Reiner Bob Loomis, has both shanks and dees. They can be used as a snaffle rein, bridle reins, draw reins or a combination of any two reins. The wide assortment of mouthpieces and rein combinations make these bits extremely versatile for training or show. The mouthpieces are 5" wide with inlaid copper bars to promote moisture ensuring a sensitive, responsive mouth. We are currently out of Loomis Shank Bits. These west coast style bits feature a high cheek-to-shank ration that reduces signal. The headstall and rein rings are mounted on a straight line with the mouthpiece- hence they are called "straight-hangers". When a horseman touches the reins, the command is instantaneous. These bits are often more ornate and used for experienced, well-trained, seasoned horses that know how to work in the arena. The medium port is a great all around bit. It applies moderate pressure to the palate, tongue and bars. When combined with the heavy, antique steel, straight cheeks it makes a bit that works well in the show pen with the seasoned pro. The copper roller helps to calm the anxious horse and applies some tongue pressure. 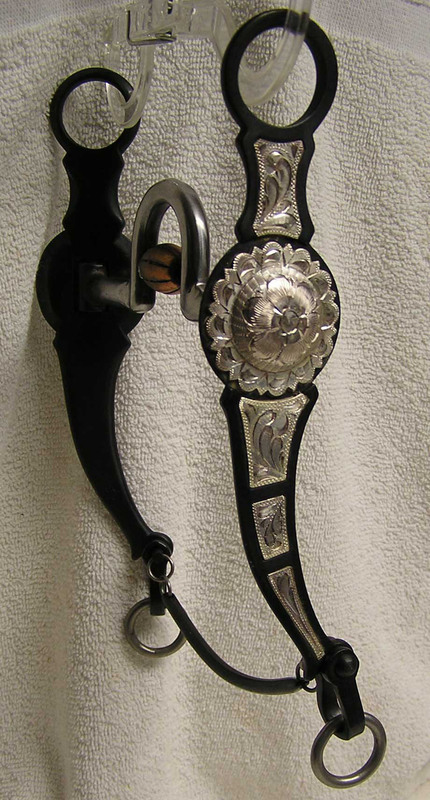 Hand engraved Silver overlay and Concho trim adds the look of the accomplished horseman. The cold steel mouthpiece will rust creating a pleasant “sweet” taste. 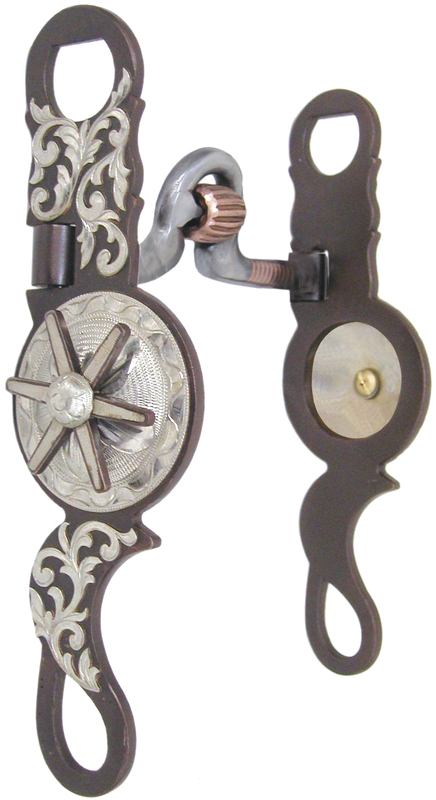 Features: 7”, antique California shanks with hand engraved Silver overlay. 5” “sweet iron”medium port mouthpiece with a copper roller and inlaid copper bars. The medium port is a great all around bit. It applies moderate pressure to the palate, tongue and bars. When combined with the heavy, antique steel, straight cheeks it makes a bit that works well in the show pen with the seasoned pro. Hand engraved Silver overlay and Concho trim adds the look of the accomplished horseman.The cold steel mouthpiece will rust creating a pleasant “sweet” taste. Features: 8”, antique California shanks with hand engraved Silver overlay. 5” medium port “sweet iron” mouth with inlaid copper bars. 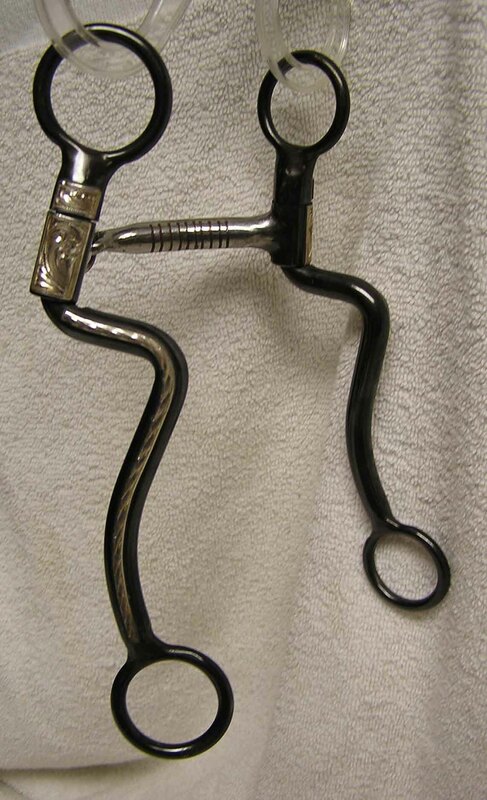 The 7 Shank was designed for the broke or more advanced horse. The lift to shank ratio quickens the leverage reaction time allowing the rider’s hand to be more subtle. Does not work well on horses stiff at the poll. All standard mouths are 5” wide with inlaid copper bars. Feature: Hand forged 7 ½” Blued Cold steel Loose Seven shanks. 5 x 7/16” snaffle mouth with inlaid copper bars. HAND ENGRAVED STERLING SILVER OVERLAY!! !